I need to say up front that I’ve never undergone a comprehensive bike fit, other than the “not so comprehensive” fit most of us receive before we wheel our shiny new road bike out of the local bike shop. Tom Petty who runs his own bike fitting business called BT Cycle Solutions contacted me a few months ago to ask if I’d be interested in hearing about what he offers and we met up a couple of weeks ago over coffee. Young Tom (I’m allowed to call him that because he’s half my age) is passionate about bike fitting and the bike industry as a whole and really inspired me with his enthusiasm. Despite his youth he clearly knows what he’s talking about. Tom says he became frustrated while working in a number of bike shops, because he wanted to help people beyond selling them the brand of bike on offer, and the limited fitting service that most of them provide before you ride off into the sunset. 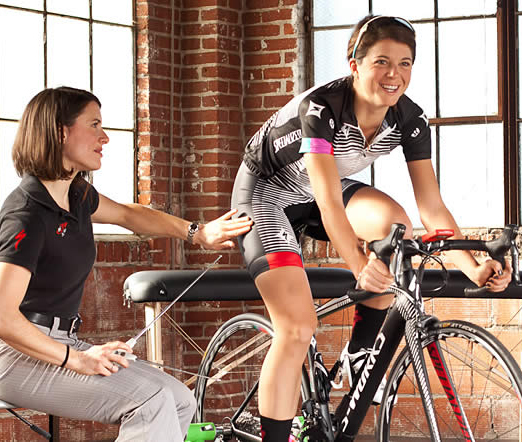 Bike fitting can be of benefit to anyone. It’s particularly beneficial if you have any type of recurring pain while riding your bike but it can also benefit someone who has a niggling minor pain that recurs. It’s a thorough assessment of a person and their bike and can involve many adjustments to tangible items like handlebars and saddles but also ride position, pedal stroke and more. I first became aware of formal comprehensive bike fitting when I bought my Specialized bike last year from Ashfield Cycles and I was offered for an additional fee a BG (Body Geometry) bike fit. It sounded pretty impressive but I concluded that unless I felt uncomfortable or in pain when I was riding then bike fitting wasn’t for me. By buying a women’s specific bike I was getting narrower handlebars, a women’s specific saddle and other benefits like different frame geometry specifically for women and it works for me. Tom’s business BT Cycle Solutions was launched earlier this year, after Tom completed his training with a group called Retul. Tom says it is based on bone measurements and he uses their system as the basis of his bike fitting service but has also added his own ‘tools’. He looks at things like flexibility, strength, pronation of the feet, measurements, but more importantly he also takes the time to understand the sort of riding each of his clients does. Unlike most bike shops or even physios who offer bike fitting services, Tom’s service is either mobile or at his inner Sydney premises and most appointments are early morning or late in the day. Tom even offers a pre-bike fit where he determines the best bike for a client and makes several recommendations to them. Specialized’s BG fit offered by most Specialized dealers. Kane Mclachlan formerly of Ashfield Cycles and now with Jet Cycles in Sydney’s CBD sent me this link to a BG fit case study on YouTube that you also might find interesting. It’s a bit cheesy. The Specialized guy describes himself as a Professor of BG Fit!!! Professional bike fitting is definitely worth considering if you bought your bike second hand and set it up yourself, or if you bought that complete bargain and it’s never felt quite right. In fact I’m sure every rider would benefit from a personalised fit. You just have to weigh up if the 300 or so dollars that it will cost is worth it to you. I’d love to hear about bike fitting experiences from other riders, both women and men. Having undergone the BG fit by Kane, in my view it is worthwhile as I had thought from many many years of cycling I was comfortable and all the fit dimensions are correct for me. Seat height was fine what Kane managed to do was slightly shorten the reach to the handlebars, better align my legs as my knees were slightly pushing outwards on the down stroke through adjusting the cleats and internal shoe shims corrected the knees. The outcome is I felt better aligned, more efficient, more powerful on the bike, the sometimes lower back pain is non-existent and the huge plus enjoying cycling more.